LyricsWoofer ads are advertisements that you are provided with by LyricsWoofer, and which you should remove from the browsers. The application is said to have a capability to find song lyrics of the videos on YouTube; however, instead of providing the user with a chance to sing karaoke, the application displays various obtrusive advertisements. 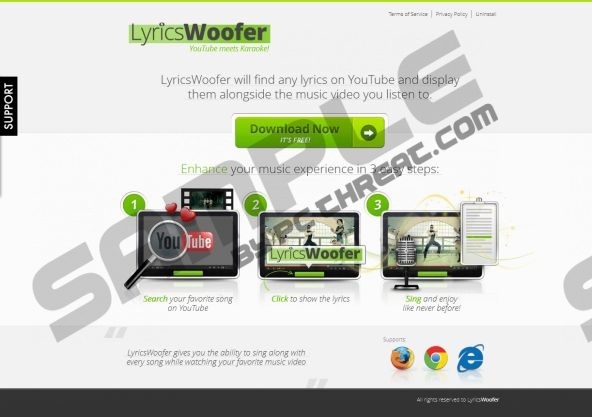 LyricsWoofer ads can be displayed on Internet Explorer, Google Chrome, and Mozilla Firefox, and once you install this browser add-on, it gets access to the information stored on your browsers, including your browsing history, which is why the removal of LyricsWoofer, whose unverified publisher is presented as woffOverEcho, should not be delayed. LyricsWoofer ads may vary. You will find various iframe advertisements promoting computer games, computer programs, food supplements, and so on. It is important to ignore LyricsWoofer ads because they are provided to increase the number of clicks on particular websites. Since not all the websites to which you are taken are reliable, you should not fill in your personal details in surveys or any other forms. You will also find in-line advertisements; more specifically, you will find some hyperlink words and when you move the cursor over an afflicted word, an advertisement is displayed. The same recommendation applies to you when dealing with in-line advertisements, so if you want to browse the Internet safely, you should remove LyricsWoofer from the PC as soon as you can. According to the description of LyricsWoofer ads at rou.resyncload.net, the advertisements are displayed according to your preferences and internet usage, which means that the application monitors how you surf the Net. Nevertheless, some of the ads may have nothing in common with your search terms. A single advertisement may take you to an advertising website full of suspicious links and other ads, and if you want to stop LyricsWoofer from disturbing your browsing, remove it from the system as soon as you can. Even though you can uninstall the program through Control Panel, we recommend that you implement SpyHunter. The anti-spyware tool will eliminate LyricsWoofer ads from the browsers and shield the system against various computer threats. All the malicious files will be deleted for you automatically, so if you want to sure that you are safe on the Internet, implement the application right now. Press Win+R and type in control panel. The removal of LyricsWoofer should be accompanied by system scanning. Once you are done with instructions, install the scanner available below to find out whether any other preventative measures should be taken. If the scanner detects some malicious files, remove from the system or invest in the program. Quick & tested solution for LyricsWoofer ads removal.